Relationships are increasingly becoming like mobile phone recharge plans these days. People hardly stay connected to loved pals beyond small misunderstandings and wrangles. Validity and diplomacy seek into existence in everyone whey they happen to connect to people. Detachments are frequently prevalent in all human emotions and end them up in freaking outs all the time. No matter whether the culture is western or Indian, emotional connect is something which keeps everyone to stay alive. Psychologically, humans need more of love to live rather than a breath. Some vacuum needs to be stuffed with charming flavors in everyone's life to keep them moving. Words are no more the actual modes of communication to your loved pals. So, your text messages, Chat history, lasting phone calls, skype conversations hardly make any difference to people if you really love. There is something more than a word which kindles you to get your best partner in your life. This is the motif of the story of the movie "Barfi" which has patched up close to my heart after watching it. Such an emotional play it is comprising sensational story in it. I would rather describe it a poem..! 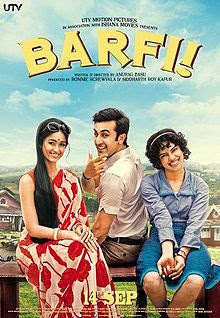 The story revolves around three aberrant characters Barfi, Jhilmul and Shruthi. Barfi, a deaf and dumb gentleman who keeps the people in his world blissful and excited throughout. He used to enjoy even smaller things in life and make others to realize their happiness. Shruti, a typical perplexed bengali girl who has fallen in love with Barfi when she has come to darjeeling for a trip with her family. Jhilmul, a mentally disabled girl who happened to fall in love with Barfi when she has found him as the best companion. The way Barfi proposes to Shruthi and his realisation of importance of Shruthi and Jhilmul in his life are the best captures of the movie. It is indeed a celestial triangular love story between these three which bollywood has never depicted before. The director has beautifully portrayed their life journey with purely emotions more than words. Applause to him when Barfi proposes Shruthi and when he leaves her for her betterment of life. Also, the tandem of relationship between Barfi and Jhilmul is breezy and touches everybody's heart. Kudos to Ranbir and Priyanka for their extreme enactment of characters and we could foresee many awards and accolades on their way for this amazing performance. We could feel like we had a short trip to Darjeeling and Kolkata post the movie which ensures the excellence in the camera lens. Background score throughout the movie adds fantabulous flavor with instrumental breeze. Overall, I have got an intense contentment of watching a beautiful movie after a very long time. Hope this Barfi could make the contemporary generation to rethink on their way of commitments in life.